Eyepieces: Choice of 5x, 6.25x, 10x, 15x, 20x, 30x or 32x high eyepoint eyepieces. 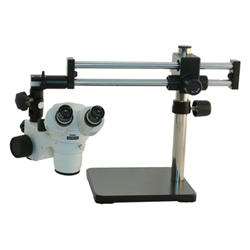 10x eyepieces are included and other magnification eyepieces can be added. 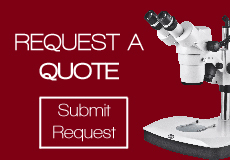 To order 6.25x or 32x eyepieces please call us, these are special-order items. Binocular head, eyetubes are inclined 35° and head rotates 360°. Trinocular head available as well. Diameter of vertical pole - 36mm. Diameter of pole for focusing mount - 32mm. Focusing: Head holder has rack and pinion focusing controls. Industrial holder is available with focusing device. Illumination: Options include no built-in illumination, LED ring light, 150w halogen dual pipe lights or 150w halogen ring light, or high intensity LED ring light. Make selection when ordering. Warranty: Five year warranty excluding any electrical parts. Illuminators have a 1-year warranty.